Scoliosis is a rare spinal condition in which the spine abnormally rotates and curves from side to side. Although scoliosis can be present at birth, it usually develops later in childhood or adolescence and is more common in young girls than boys. Many children are screened for scoliosis in school between grades 5 and 9 since the condition typically progresses most rapidly during a child's growth spurt years. Scoliosis can range from very mild to extremely severe, depending on the degree of the curvature of the spine. Even though most cases are considered minor and are not painful, the condition may be a source of body image anxiety and low self-esteem for some teens. In more severe cases, the child may suffer potentially serious complications such as respiratory difficulty and physical deformities. Early diagnosis is key to limiting the extent of the curvature. The more the spine curves and rotates, the worse the deformity becomes. If a brace fails to control the progression of the curve, surgery is considered. 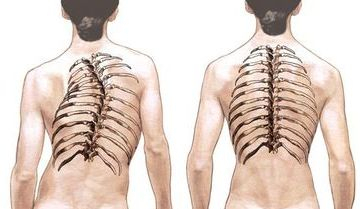 In these instances, the spine has rotated, twisting the chest with it. This pushes the shoulder blade and ribs off the back, creating a hump as well as unevenness in front to the chest. Often the hips follow in a tilted posture. Scoliosis surgery straightens the curve in the spine and fuses together the individual spinal segments and joints that are involved in the curve. This surgery has been found to be a safe and effective treatment. While severe scoliotic curves cannot be completely straightened, they may often be dramatically improved. The term kyphosis is used to describe an exaggerated curvature of the spine that gives the back a rounded appearance. Kyphosis can be caused by a number of conditions including poor posture, osteoporosis and long term use of steroids or spine tumors. In the most serious cases, a dramatic curve happens after multiple vertebra fracture and collapse. A physical examination and x-rays of the spine will provide the physician with the information needed to determine the extent of any spinal abnormality. A curve of more than 45 degrees is considered abnormal. Treatment for kyphosis varies depending on the type and severity of the condition. Teens with postural kyphosis will not generally suffer any complications or progression of the condition and may even improve with time. An exercise program may help with any back pain. For patients with Scheuermann's kyphosis, a conservative treatment program may include exercise and anti-inflammatory medications. If the child is still growing, a brace may be prescribed to help limit the curvature. If a kyphotic curve is more than 75 degrees, surgery may be an option. The doctor may chose to straighten and fuse the vertebrae of the abnormal segment together to stabilize the spine and relieve any pain associated with the instability.